Kimberly Jones-Pothier wants to see ordinary people healed from past hurts and having a fresh encounter with the love of God. Jones-Pothier co-pastors the Church of the Harvest Fayetteville in Fayetteville, Georgia, with her husband, Mark Pothier. She was even featured as one of the stars of Oxygen's reality television series Preachers of Atlanta. But if you catch her on the phone between meetings, she's not playing games or sneaking a quick break from the busyness. She's pastoring her second church—a digital community of hundreds of thousands of people cultivated across Instagram, Facebook and Twitter. Those followers know her as "Real Talk Kim," the feisty preacher whose alternately encouraging and challenging bite-size Bible teachings may be the only exposure to Christianity they ever receive. These people might never darken the door of a church—but they'll watch a Facebook Live stream. Maybe it's her disarming appearance. Between her platinum-blond pixie-cut updo, thick cat-eye glasses and sleek fashion, Jones-Pothier doesn't look like the average pastor. For that, she's used to facing judgment, most of all by fellow church members. But she says those experiences have only made her stronger. "There's something about going to hell," she says. "You come out on fire." Jones-Pothier was a prodigal long before she was a preacher. Though raised in the United Pentecostal Church, she bristled from an early age against her church's religious spirit. By the time she was 20, she had married, divorced and married again—something frowned upon at her church, where Jones-Pothier says "they believed that divorce would send you straight to hell." Jones-Pothier admits she did not have a relationship with God like she has now, instead chasing temporary answers to her deepest insecurities. She jumped from relationship to relationship—even marriage to marriage—because she felt she needed a man to make her life complete. Shortly before her second marriage, Pastor Rod Parsley warned her to change her ways. Jones-Pothier remembers Parsley telling her, "Kim, I've seen you and that boy having eyes for each other, and I am not going to bless that relationship. You need to cut it off. You need to stop playing. You're jumping out of the frying pan into the fire. You already got married, [and] it lasted six months. I'm not going to bless this relationship." She responded to his rebuke by packing her car in the middle of the night and running away. She married her second husband and had a family. They became praise and worship pastors for the first seven years of their marriage. But the final 10 years of their marriage became "toxic" and spiraled out of control. Her husband was an alcoholic who would frequently leave the family for days to binge-drink. He became abusive. "Sin will take you further than you want to go, cost you more than you want to pay and keep you longer than you want to stay," Jones-Pothier says. "That's what happened to me. Abuse had set into my marriage and, in 2006, I found myself in a bush one night, running for my life, realizing that if I didn't get out of the house, I was going to die that night. I've never been so scared in my life. After that, I called my parents, and they came and got me, and that's when my healing process started." Jones-Pothier says she lost everything when that happened. She lost her $500,000 house, her Mercedes and all of her friends. She had to swallow her pride, take her two sons and move into a 10-by-10-foot bedroom—"the size of my old walk-in closet"—at her parents' place. She got a job at Bloomingdale's. Faced with the futility and failure of all her efforts, she surrendered. And slowly, God began to heal her from the inside out. "I surrendered, and God just started doing the work," Jones-Pothier says. "I told Him I'd give Him a year to heal me. He took five. I was so bad off. Now I look around and I'm just so thankful—thankful that I didn't abort the mission, that all those times I thought God was not around, He definitely was around. He was using my pain as a purpose. ... He said, 'I'm just going to take you out to rock bottom and make you find out who the rock is at the bottom, which is Jesus.'" She had to learn to stop holding onto her own pain and release it to God. "I would lay in bed at night and just cry in my mom and dad's house," Jones-Pothier says. "I finally got to that place where it was just me and God, and I was desperate. I was like, 'God, take this pain away from me. If you're not going to heal my marriage, take this pain away.' The first time I ever heard God really was when He said, 'I ain't gonna take it away. You've got to walk away from it. You've got to stop nursing it. You've got to stop going back. I can't make you do anything, Kim. You've got to surrender.' That's when I really found God." During that time, Jones-Pothier got a job in cosmetics—an unlikely fit, she notes, because she hated people. But her bitterness and contempt melted away "one face at a time," as she heard people share their stories of trials and adversities. She learned many people had even worse stories than hers, and that shook her out of her self-pity and awakened her love for others. Her turning point came on her 39th birthday. She was stuck on the side of the road after her car broke down. Rather than turning back to past bitterness or negativity, she decided to take the moment to make an encouraging video and post it to social media. "I just encouraged people not to give up, and even if they created their own storm, God is going to use those storms to elevate you to your purpose," Jones-Pothier says. "'Don't give up. Don't get weary of well doing.' That video ended up going viral, and I ended up going from 600 friends to like 200,000, and then it just kept growing and growing." Jones-Pothier says she doesn't know how or why it went viral and gives God all the credit. She believes even her hastily chosen username, @realtalkkim, was God-ordained. "God gave me my name, Real Talk Kim, on Twitter," she says. "He knew that I was going to have a ministry where I could really get real with people. That name just sets it up. Twitter gave it to me because my name was already used, so Twitter said, 'Here, this is a good night for you.' And I took it. Who in a million years [thought] just five years later Real Talk Kim would be a brand? It fits my ministry." Now Jones-Pothier is the co-pastor of Church of the Harvest Fayetteville and, thanks to her online following, a traveling evangelist and preacher. She's also in a healthy marriage and recently released a book, When Your Bad Meets His Good. She even managed to repair her relationship with Parsley, to whom she didn't speak for years after immediately ditching him because of his rebuke. In 2016, Parsley—who pastors World Harvest Church Columbus in Columbus, Ohio—reached out to Jones-Pothier and asked her to preach at one of his church's biggest camp meetings. She was flabbergasted. "The very man I left in the middle of the night to go disobey his words, he asked me to come back and preach one of the biggest camp meetings at World Harvest Church," Jones-Pothier says. "Man, that was like vindication, like redemption. God, you are the coolest—that I'm preaching now on the platform of the very man who basically prophesied, 'Your marriage is going to stink.' My whole life is like a bunch of redemption. Now [Parsley is] my spiritual dad. ... He's one of my spiritual people I really honor and look up to now." Parsley likewise considers Jones-Pothier to be a spiritual daughter and says she's come a long way. 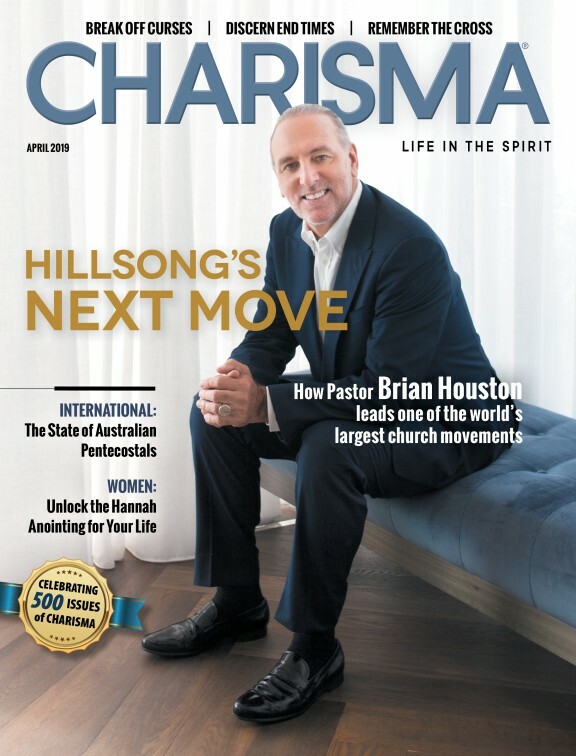 "As her pastor during a tumultuous season in her life, I have seen the transformation from an insecure young woman to a powerfully anointed woman of God," Parsley says. "With keen insight and endearing humor, Kim speaks with authority and the redemptive love of God. ... As her spiritual father, I'm so proud of her and this dynamic message that's touching the hearts of an entire generation." Rev. Dr. Samuel Rodriguez, president of the National Hispanic Christian Leadership Conference, says the message and testimony of Real Talk Kim is transforming lives. "Pastor Kim is without a doubt one of the most anointed and gifted voices on the planet today," Rodriguez says. But as Jones-Pothier will repeatedly point out, to her own amazement, all this success has only happened within the last five years. Yet she says she doesn't feel any different or have any problem acclimating to her newfound fame. "I get asked a lot, just even when I do regular interviews, 'How you do you feel with this ... new level?'" Jones-Pothier says. "Man, I don't feel no different. I'm just honored and thankful that God's given me this and that He trusts me with this. I don't feel any different. I really don't. It's just people. I don't even pay attention to it. I just get up every day and [stay] intentional." Jones-Pothier handles every single social media interaction by herself across her many platforms. She doesn't have a team to manage her thousands of followers, mostly because she believes God has given them to her, so they are her responsibility. She says her only goals are to make God proud and prevent people from making the same mistakes she made. "When God was healing me, my one prayer request was, 'God, I want to get to such a place that I can be there for people,'" she says. "Because if I would have had a Real Talk Kim in my life, I would not have made half the mistakes that I made." She feels called to reach the down-and-out because "the harder you fall, the higher you bounce. God loves people with the worst past to create the best futures, because people are sleeping on you. They don't see you coming back. All of a sudden? Ta-da! There you are. And they weren't even ready for it. They weren't even thinking you were going to make it." Because of her audience, she tries to focus on the practical more than the theological. "I'm trying to let people get back to the basics," Jones-Pothier says. "[I'm there] at 3:00 in the morning, when they're having panic attacks and fear's gripping their life, [to remind them] that they've got God on the inside of them, that they can lay hands on themselves, because the same power that raised Jesus from the dead lives on the inside of them when they stay focused on God and they keep God the center." Though her messages are largely motivational, she says it's important to instill people with a proper fear of the Lord. But that's very different, she argues, than making someone afraid of religion or of disobeying the rules. True fear of the Lord comes from selflessness, from remembering that you live your life for God and that you are divinely called to be "Jesus with skin on" to a world that desperately needs Him. It's a message she says she keeps close to her heart: that her ministry is successful, not because of her, but because of the Spirit inside her. "I'm proof that God can qualify you and put you places you never thought you would go," she says. "So keep your heart right. Don't give up. All you people out there that are reading this, I don't care if you're 58, 48, 38 or 78—it is never too late for God to open the window to heaven for your life. And He's going to give you back everything the devil stole. He's about to give you back seven times restitution. What would normally take 12 years is going to take two. That's how God rolls. So just surrender. Just let Him blow your mind." Christian leaders across the country have written hundreds of articles dissecting Millennials and Generation Z, trying to find the magic cure to reverse years of declining religious affiliation. Jones-Pothier—whose online church community includes many Millennials—recommends not overthinking the problem. Contrary to stereotypes that Millennials are stubborn and rebellious, Jones-Pothier believes, "They really aren't. They're just not going to fall for fake." Instead, what she sees the next generation crave is authenticity and responsibility. Jones-Pothier says Millennials can read through fake from a mile away, and they'll turn the other way. So she takes the opposite approach: brutal honesty. "I have such a huge Millennial following, and I think it's because [they say], 'Tell us—don't go easy on us,'" she says. "It's really tough love, you know. In church, we've got so many seeker-friendly churches now. I ain't got no problem with them, but that's not what God's called me to do. God's called me to get in your face and say, 'You know what? It ain't your dad's fault. It ain't your mama's fault. They might have done everything that you say they did to you, but you, at some point, have got to get up and leave that pain. Get up. Quit being angry about it and just punch the devil in the teeth, man, with your story of healing and restoration.'" Her other secret weapon is giving these young churchgoers both lots of responsibility and the autonomy to handle that responsibility as they see fit. "I just believe the key is getting these kids and getting them involved," she says. "You cannot smother them. You can't micromanage them. You've just got to let them fly. So that's what we do at our church. ... We let them fly, and it's amazing watching them. And that's the way you're going to have to do it. I believe they're hungry. They want to see change." It's an approach that works for more than just Millennials. Thanks to her unique style and her appearance on Preachers of Atlanta, Jones-Pothier says she's attracted a whole new audience of people who would never otherwise listen to God. She's seen her inspirational videos go viral and get passed around corners of the internet better known for vulgarity than holiness. For some people, it's the only Christian content they may see all day, week or even year. She couldn't be prouder—or feel the weight more profoundly. "I have altar calls on my Facebook lines, and I'll have 1,200 people give their heart to the Lord," Jones-Pothier says. "And then at that point, I've got to start discipling them." That discipling results in followers who may never walk into a church, but they'll watch her sermon every week after it's uploaded on YouTube. They'll watch her on Facebook Live as she explains how to experience the power of the Holy Spirit or how to study the Bible. "I even get to watch as people that have been following me for two years—I'm talking strung-out addicts or [people struggling with] anorexia—I get to watch them now all of a sudden getting completely healed and restored, getting married, their kids are coming back to them because they were taken away from the addiction," Jones-Pothier says. "I just get to watch as these people really get delivered. And that keeps me going." So what's next for Real Talk Kim? "People tell me all the time, 'I bet you knew this would happen,'" she says. "Lord, no! It wasn't even on my vision board. I never dreamed, ever, that I would be where I am now. So if God's just going to keep doing this, I'm just riding this ride. I'm thankful. I'm humbled. I'm honored. And I don't even know where I'll be in five more years."